Powers/Abilities: Headhunter can mesmerize and control others. She accomplishes this via some energy released from her eyes, which is effective against most others who look into her eyes. 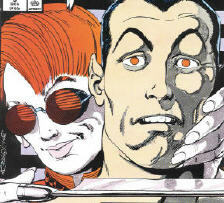 Namor and Namorita are two notable exceptions, and possibly others with eyes which vary somewhat from the human norm. With effort, she was able to counter Puppet Master's control. Her powers are sufficient to maintain control over others for years. It's unclear whether she dyes her hair, but despite the fact that her hair and eyes are bright red, she otherwise exhibits the characteristics of an albino. She is extremely sensitive to light: she prefers to remain in her own offices--using a red light is less painful for her, and even then, she wears special glasses to filter out some of the painful light. Headhunter possesses great financial power, and she is well renown as a mover and shaker on Wall Street. She enters into contracts with others, where she accomplishes a needed task for them, under the condition that they will owe her their head in one year's time after the completion of her side of the contract--no one takes it quite literally enough. When the time comes, Headhunter mesmerizes her victims, and then makes them believe that she has actually decapitated them, and is keeping them alive via advanced life support. Their heads are then mounted on her wall, where she can call on them for financial or other advice at any time she sees fit. In reality, she does not decapitate her victims, but instead has their heads placed through the wall and seemingly mounted, while their bodies are maintained on normal life support. She even had a mirror placed to cover their bodies that gives the illusion that the heads are indeed separated from their bodies. This illusion is necessary for her power to maintain the belief in her victims of their de-corporated (you like that? just made it up!) existence. Headhunter is served by Mr. Bonds, Mr. Stocks, and Ticker--names all obviously derived from Wall Street. Her agents do her errands, fly her helicopter, and shoot her enemies. (What else could you ask for from an employee?) When necessary, she is capable of flying her own helicopter. Besides the Wall Street motif, she's also big into red. Her clothes, helicopter, and the lighting of her place are all red. She sometimes wears a pair of straight razors on her fingers, but they seem to be just part of the illusion of decapitation she attempts to create. The blades have proven to be exceptionally sharp. Headhunter's powers surfaced at an early age and she used them to manipulate others to gain great wealth and financial power. At some point, she began her plot of taking the heads of others to aid her continuously. (Namor I#7 (fb)-BTS) - Headhunter made a deal with Desmond Marrs. (Namor I#2) - Headhunter became interested in a report of a "flying naked man" fighting the Griffin. (Namor I#3) - Mr. Bonds flew Headhunter to the site of the air struggle, where she learned the man was Namor. She decided to follow him to learn what he was involved in. (Namor I#7) - Headhunter paid a visit to Phoebe and Desmond Marrs, preparing to collect on the debt Desmond owed him. (Namor I#8) - When Namor, alongside Phoebe Marrs, paid a visit to Headhunter, she happily showed him her wall of heads, including the newly placed Desmond Marrs. (Namor I#9) - Headhunter explained her "Skull Orchard" to Namor, and then prepared to make him her next trophy. (Namor I#9 (fb) - BTS) - Namor's eyes proved immune to Headhunter's power, but he played along to learn what was really going on. (Namor I#9) - Headhunter planned to use her newest trophy to discover the lost sunken treasures in the ocean. When Namorita (having traced Namor to Headhunter's headquarters) broke in, Headhunter sicked Mr. Stocks on her. As she tried her power on Namorita, and failed, Namor revealed that he, too, was unaffected. He broke out, revealing the true state of her captives. Headhunter fled in her helicopter, and when Namor pursued her, she blew the helicopter up. The main cabin remained in one piece, and Namor followed it into the East River, but there was no evidence of her body in the wreckage. (Villains for Hire#0.1) – Purple Man, ruminating on how his Heroes for Hire project failed, decided to start a new project. He had Headhunter organize a list of villainous candidates for him, and asked her to contact the Mole Man about an operation. (Villains for Hire#1) – Purple Man and Headhunter had Shocker knock out power in parts of New York City, Avalanche shanghai a truck, and a new female Death Stalker kill the guards. Tiger Shark, Bombshell, and Crossfire attacked to steal the truck, and Death-Stalker was seemingly killed. An angry Purple Man turned the chair over to Headhunter for the back-up plan. They sent Scourge (actually Paladin undercover) to follow up and the revived Death Stalker tried stopping Nightshade from picking up the others, but Nightshade was a robot and her helicopter blew up. They retrieved the truck, which was full of collected police evidence, including numbers to Maggia bank accounts. Purple Man refused to believe Misty Knight was behind it. (Villains for Hire#2) – Purple Man and Headhunter hired Bushmaster and Monster to join their team and they sent them with Death Stalker to retrieve Adamantium chips that Purple Man planned to interface A.I.M. and Hydra with, but Misty’s operatives Bombshell, Lady Stilt-Man, and Speed Demon escaped with them. Meeting at the Bar with No Name, Headhunter and Shocker drew Tiger Shark and Bombshell in to provide intel, though they didn’t know who their handler was. Headhunter and Purple Man saw Misty shoot down Paladin. (Villains for Hire#3) – After a fierce fight between Misty Knight's operatives and those of Purple Man's, who were ultimately victorious, Purple Man and Headhunter revealed themselves just as they learned Puppet Master was behind Misty’s actions. 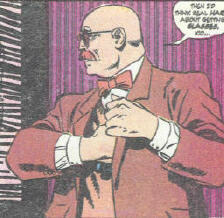 (Villains for Hire#4) – Puppet Master briefly asserted control of the villains, but Headhunter and Purple Man were able counter his influence. The villains savagely battled with Headhunter cutting of Death Stalker's arm before threatening Misty Knight. Scourge stopped her and revealed himself to be Paladin. Although many of the villains escaped, Headhunter and others were arrested by the NYPD. (Uncanny X-Men III#23) - After the Phoenix Five had undone the Scarlet Witch's "no more mutants" spell and mutants started to reappear on Earth, Madripoor became somewhat of a mutant utopia. Headhunter, like so many of her kind, traveled to the island state to make a new life for herself. Suspension of Disbelief and all, but the human body wouldn't do so well lying in one position and being fed IV for great lengths of time--bed sores, not to mention the body's excretory systems and what not...you get the picture. Still, it's a fun story. Headhunter was a fun character. 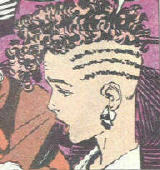 Maybe if the new heads of Marvel can make nice with John Byrne (not that I'm taking sides) we'll see her again. Profile by Snood. Updated by Grendel Prime (with Chadman). Helicopter pilot and enforcer. Virtually identical to Mr. Stocks. He accompanied Headhunter when she went to collect Desmond Marrs. Personal Assistant to Headhunter. She's a worrier, and didn't demonstrate fighting skills.